MIAMI--(BUSINESS WIRE)--Every hour a hungry fan takes to Twitter to ask for POPEYES® delivery. POPEYES® read the tweets and heard the hunger pains and today unveils the solution with Uber Eats delivery. Guests in New York, New Jersey, Chicago, Miami and Washington D.C. can now enjoy their favorite POPEYES® menu items from the comfort of their home or office. Those craving POPEYES® can now order cult-favorite menu items including BONAFIDE® chicken, hot biscuits, red beans and rice and more on the Uber Eats mobile app or on UberEats.com. From the 12 hour marination process to the hand battering of our chicken in restaurant, quality is a major priority for the brand. Uber Eats will make sure you get it fresh & crispy. For more information about POPEYES® delivery please visit www.popeyes.com. Founded in New Orleans in 1972, POPEYES® has more than 40 years of history and culinary tradition. 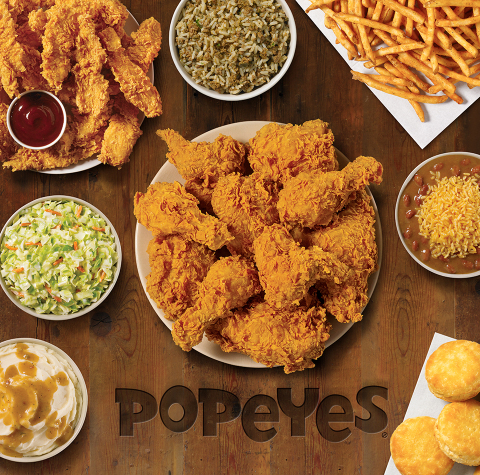 POPEYES® distinguishes itself with a unique New Orleans style menu featuring spicy chicken, chicken tenders, fried shrimp, and other regional items. The chain’s passion for its Louisiana heritage and flavorful authentic food has allowed POPEYES® to become one of the world’s largest chicken quick service restaurants with over 2,900 restaurants in the U.S. and around the world. To learn more about the POPEYES® brand, please visit the POPEYES® brand website at www.popeyes.com or follow us on Facebook, Twitter and Instagram.